In the second part of this article on the Orbea Enduro Team camp, we focus on the material tests our riders carried out to hone their machines for competition. Want to see how we prepare the Rallon for the Enduro World Series? One of the main objectives for this stage of the team camp in Le Boulou (a French town located around 20 km south of Perpignan, at the foot of the Pyrenees) was to configure the Rallon R5, tailoring it to each rider in terms of their characteristics and preferences. 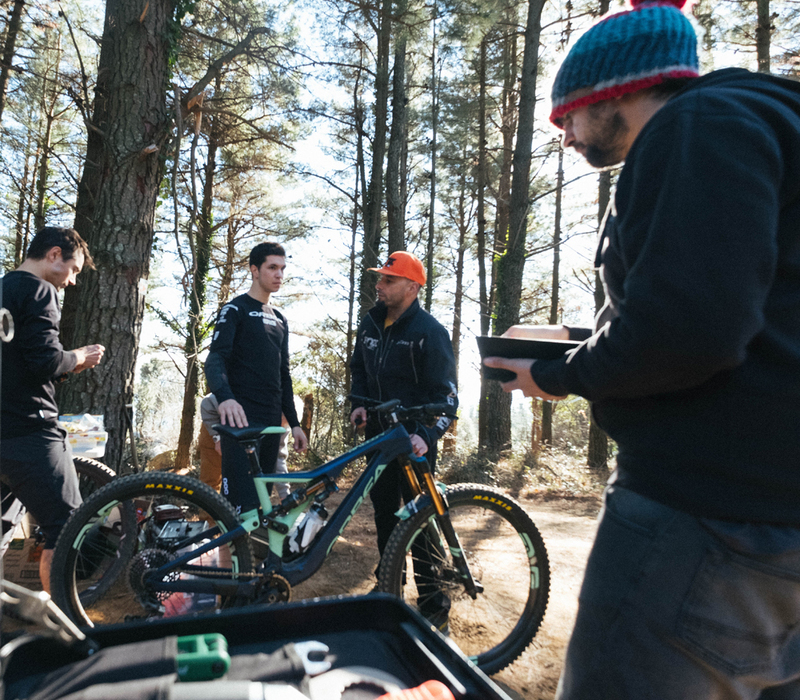 For five intense days, the Orbea Enduro Team riders tested the new gear from ENVE and Fox, making the necessary adjustments to create the base configuration of their bikes, customized for each of them. This setting will vary for each race in the Enduro World Series, according to the demands of the course (how rocky it is, how many pedaling zones there are, etc.). 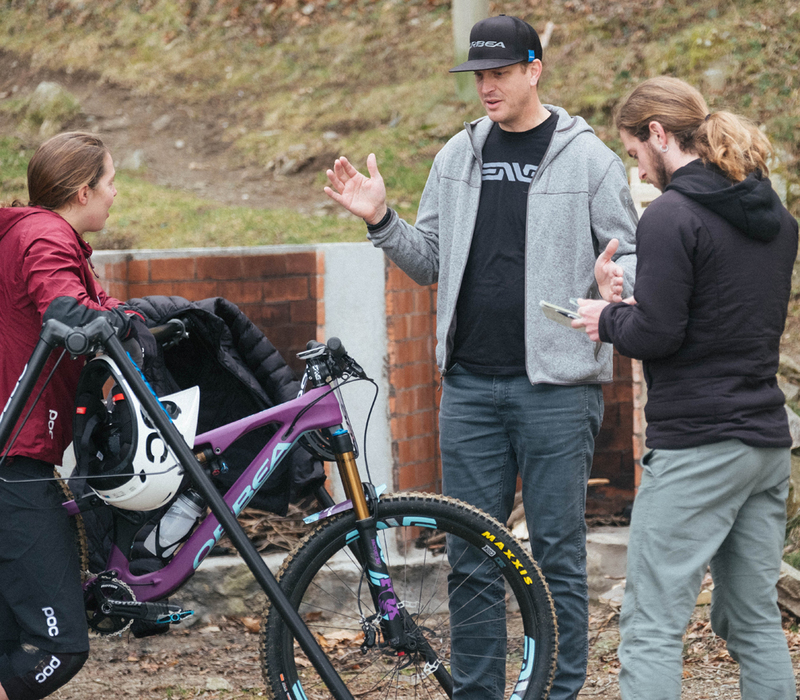 Technicians from ENVE and Fox worked alongside the team throughout the stage to conduct the different tests on the wheels, tires, handlebars, stems, forks and suspensions. Using the results of these tests and the feedback and sensations communicated by the riders, the team mechanics adjusted the suspensions, rebound, changing heights and pressures…for each of them. After these adjustments were made the riders were ready to take off on their Rallon. We know that suspension play a decisive role in how an enduro bike behaves: it’s not just a matter of achieving maximum performance on physically demanding technical descents, but also for the bike to be light and efficient in terms of pedaling, so that the rider reaches the time sections as fresh as possible. It is a very delicate balance that is difficult to achieve, given that it requires gross absorption capacities that are not so different from DH, while at the same time, keeping the added weight to a minimum, so the bike responds well on uphill climbs or pedaling stretches during sprints, which can mean the difference between winning and losing a race. The suspension is responsible for all this, to a greater extent than any other component. This is why it was the first thing we tested at the team camp, along with Diego Grasa, from Fox. The Rallon has a 160-mm Fox 36 Float Factory fork mounted with a closed hydraulic cartridge, called FIT, along with a Fox DHX2 Factory shock. ENVE is also a very important travel companion for the Orbea Enduro Team project, which is why they wanted to join the team during the stage. A.J. Turner, from Enve, brought along the M7 Series wheels to the stage, complete with an exclusive patented technology called "Protective Rim Strip," which eliminates flat tires as the result of punctures, a common problem among elite enduro racers. The riders have told us that, thanks to them, they had a sensation of a fast, agile ride, which was also helped by the handlebars and stems made by the American brand. The goal? To adjust the degree of flexion of each part so that it provides just the right balance between manageability and reactivity. This mitigates the annoying vibrations and improves control over the bike, thus giving riders the confidence they need to take it to the limit in competition. To test the material, we found a spot with a short run (between 5 and 10’), where the Orbea Enduro Team riders could have clear, verifiable references. The first thing tested was the suspensions: after establishing a base configuration according to the physical characteristics of each rider, our athletes took to the track. In this sense, we have to say that the X2 shock range, both spring and air, offered excellent adjustment options, with four-way adjustment and minimal increases in stiffness from one spring to the next. The 4-way adjustment lets us regulate the rebound and compression at both slow and fast speeds (with speed understood as the rebound or compression speed, not the speed of the bicycle).In other words, we made 4 different adjustments in order to ensure the perfect customization of the shock absorption, according to the preferences of each rider. This is how we managed to obtain the final setting that best suited the preferences of each rider, although we must remember that this configuration obviously varied according to the characteristics of the course ridden by the Orbea Enduro Team. The choices of tires and ideal pressures for each were also tested on the terrain. 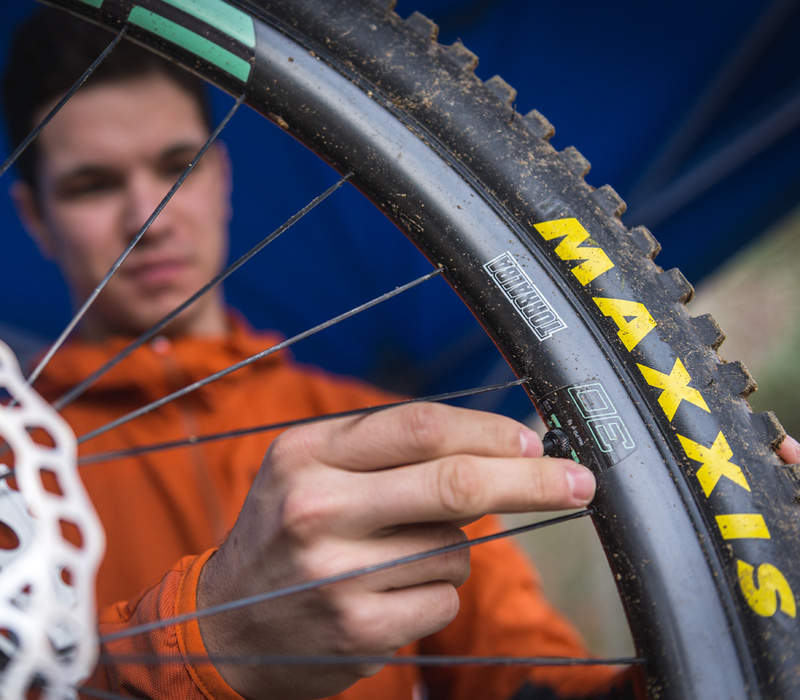 Thanks to these tests, the Orbea Enduro Team riders could significantly reduce the pressures of their tires for better traction and greater confidence. We could also trace the most appropriate paths along some very technical sections, to let them go faster without getting tired. We also measured the specific configurations of their handlebars to optimize the angle in terms of their position on the bike. 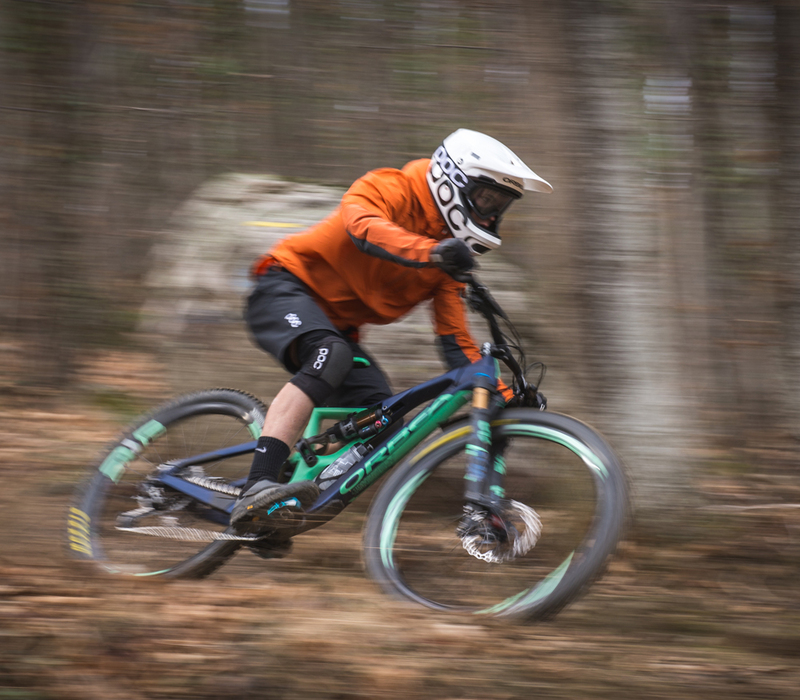 The Orbea Enduro Team also tested for the first time their competition gear from POC, as well as the rest of the material from Rotor, Maxxis, CrankBrothers, Selle Italia, Galfer, Slicy and Morgan Blue, which they will use in the Enduro World Series. And of course, between test and test, our riders got their strength back by eating Clif Bar energy bars. After this first contact, the bikers went back home to continue testing the bicycle at their usual training locations. On trails they’ve mastered and know perfectly well, they will be able to take the Rallon to the limit and validate the configuration made during the stage. The Enduro World Series begin on March 24-25 in Lo Barnechea (Chile).You can follow this competition on the Orbea Enduro Team’s social networks (Facebook / Instagram) and at orbea.com.